Near Tengah Plantation MRT, very near to November 2018's plot. Near new Woodlands South MRT that is expected to be completed this year. 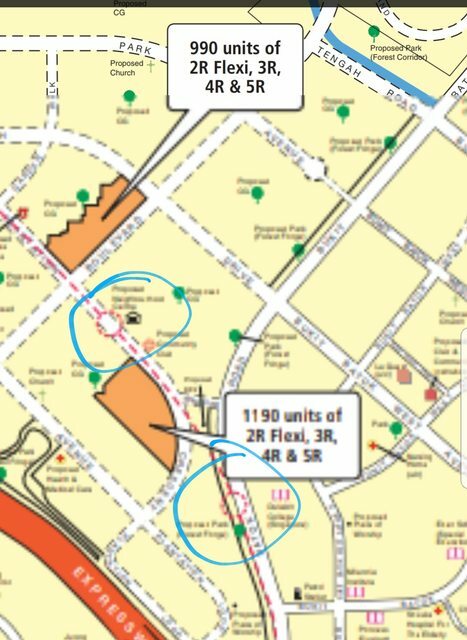 Near Boon Keng MRT, very near to Feb 2019's plot. Last edited by workedmw; 12-02-2019 at 10:36 AM..
Is the tengah location better or worst as compared to last November’s plot? The KW is slightly better IMO as its right beside the MRT entrance. Believe the Tengah one is better as well as one of the plots is walking distance from the future Tengah town centre. Last edited by glorfindel; 12-02-2019 at 11:37 AM..
Last edited by LinnnX; 12-02-2019 at 11:41 AM..
Near mrt which is opening end of this year. Got a small neighbourhood shop nearby. If u looking at north side i feel its quite a good location. 3 stops from woodlands town center. With 2 new MRT lines up this year, I think there will be more attractive BTO coming up in Woodlands soon. Woodlands South (May'19 BTO) is probably the less attractive one compared to Woodlands North (future BTO). Woodlands North may have waterfront flats coming up soon too. Either way, Woodlands will not be the same Woodlands 5~10 years later with new Thomson-East Coast Line and new expressway linking to town. So from investment point of view I think it is pretty good. Last edited by workedmw; 12-02-2019 at 04:30 PM..